MIRO's operating system and configuration are stored on a micro-SD card plugged into the P3 board. Usually it will stay there, but you may need access to it during commissioning or when performing a system update or repair. Optionally, you can supply your own SD card. Any micro-SD card of at least 4GB can be used with MIRO, but you can use up to 32GB if you want more space for data on-board. You will need to program a new SD card before you can use it with MIRO—see Reprogram P3. If the card is currently installed, you will have to first remove the body shell to gain access to it. 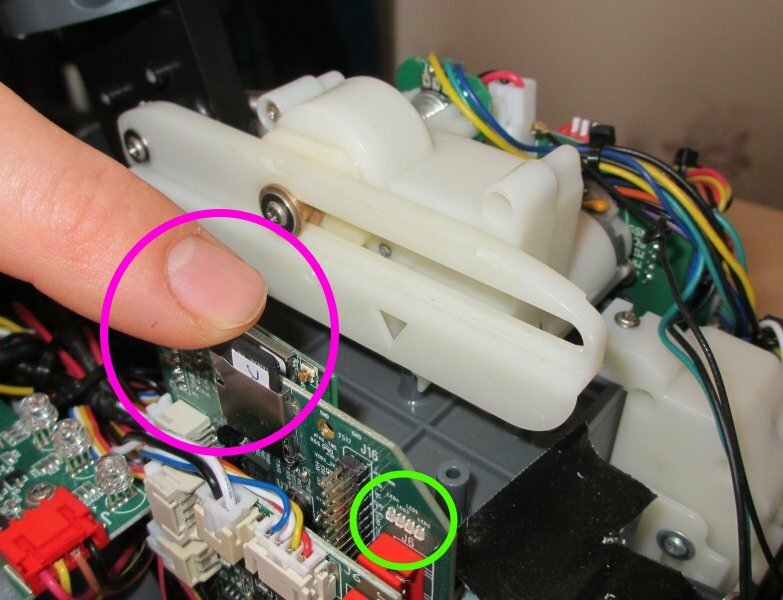 Once this is done, you will see the card that is plugged into the P3 board, circled in magenta below. Remove the card by pressing down on it and then releasing. To install, press the card into the slot until it clicks, and then release it. It will be retained in the slot.